Support Getting started Can I pair H10 with several devices? Can I pair H10 with several devices? You can pair H10 with more than one Bluetooth devices, but usually you can use it with just one at a time. However, with the Polar Beat app, you can turn dual Bluetooth setting on, and then you can use H10 simultaneously with two devices, for example with compatible gym equipment and your Polar device and see your live heart rate in both devices. Go to Settings > HR sensor. Wear and pair the H10 heart rate sensor (version 2.1.9 or newer). 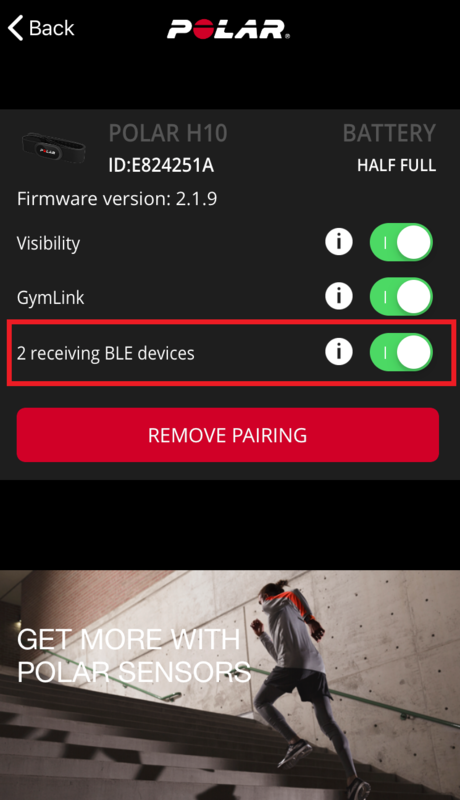 Toggle 2 receiving BLE devices on. Polar USASupportCan I pair H10 with several devices?